Do you do weekly food prep on Sundays? I know some bloggers who cook / bake / prep 15+ things and spend hours upons hours in the kitchen on Sunday afternoon getting everything ready for the week. I am not one of those people. BUT, over the past year I have developed some habits that are quick, easy, and worth sharing to help you set yourself up for a healthy and delicious week ahead! 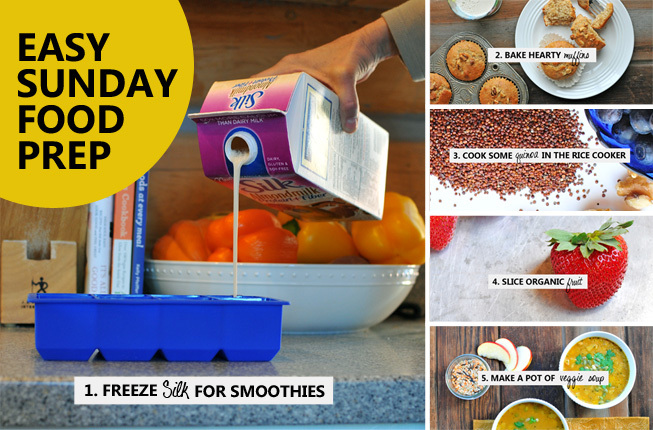 Food prep tips that will help breakfasts be quicker, smoothies be creamier, weeknight dinners be more protein-packed, and work lunches be more filling. Those all sound like good things to me!! I freeze individual 2 tablespoon servings of Silk almondmilk in ice cube trays. Then, instead of ice, throw a cube or two of the frozen almondmilk into your blender and your smoothie will be nice and creamy. I love making a batch of muffins on Sunday so I can heat up one or two for breakfasts throughout the week (alternating with smoothies, of course!). Some of my favorites are these banana nut ones, or these. I had done it on the stovetop for a few years, when my inlaws suggested I try it in the rice cooker... and I'm so glad I did! It cooks up perfectly: less crunchy pieces, more evenly cooked, no stirring or tending required. Add 2 cups of dry (rinsed) quinoa into the rice cooker, then add 2 cups water plus 2 cups of broth (chicken or veggie will work). Hit cook, then 20 minutes later... perfectly cooked quinoa ready to throw into soups, salads, & tacos! Having prepped, cut fruit around makes it an easier snack to grab throughout the week or to pack for lunches... so slice up that canteloupe or pineapple or strawberries and keep them in a tupperware in the fridge until you're ready to devour! I do this every Sunday now. I adore soup and when you make it broth-based and pack it full of veggies and a protein like lentils or quinoa... it's the perfect thing to bring to work for lunch or to have as a heartier afternoon snack. And if you're in full-on holiday mode, I totally understand. Pin these tips for a healthy new year! Pin these Food Prep Tips for Later! QUESTION: Do you do any Sunday food prep? This conversation is sponsored by Silk. The opinions, text, recipe, and beautiful photography are all mine. Silk is a local Colorado company that I’ve had the pleasure of working with this past year. I love how they've grown in their product integrity, variety of product options, and commitment to a healthy, protein-packed plant-based diet. In a large stockpot over medium high heat, melt coconut oil. Then add carrots, apple, bell pepper, garlic, Montreal chicken seasoning, and dried onions. Saute for approximately 5 minutes, until carrots are slightly softened. Then add in all other ingredients. Simmer for 30 - 40 minutes until rice and lentils are fully cooked.